Thanks for this. My reaction also on seeing this (postage stamp size initially). I was a bit baffled. @jolyonmaugham, someone I respect, shared a link to an article on the history of the "eye" and seemed uncharacteristically dismissive of any unfamiliarity with it. I took a look and it was a TL;DR special and unconvincing. @dannythefink, also outraged that anyone couldn't see it, shared a close up of a man with a beard (both of theses responses w others on Twitter). Well, in all my life I have never assumed beards were Jewish. The idea seems laughable. I accept that anti-Semitism exists but the idea that any bearded capitalist must be Jewish seems bizarre and a case of confirmation bias. The greatest scholars of that topic (two brilliant Jews, Kahneman & Tversky) never said anything about it in this context, alas. @chrismullinexmp is inclined to believe that some of outrage and solidarity are confected and opportunistic but has been excoriated for his temerity. Anyone who has read his books would know he has been around long enough to have seen how things work in the right wing media and that he is a humane, skeptical, decent individual. But doubt of Corbyn's guilt is unacceptable in some quarters. He may also have seen a postage stamp version of this initially, and if he saw beards (I didn't), may not have thought "Jews!" (I still didn't). As you say, a witch-hunt. It' a witch hunt, but it's clear that Corbyn really is a bit blind to Jew-hatred. Still, it's surprising that he hasn't run with the defence that the pictured old white guys, aren't obviously Jews. So maybe he accepts that he's been a bit blind to Jew-hatred. Maybe he'll reform. Isn't the all-seeing-eye a Masonic symbol? 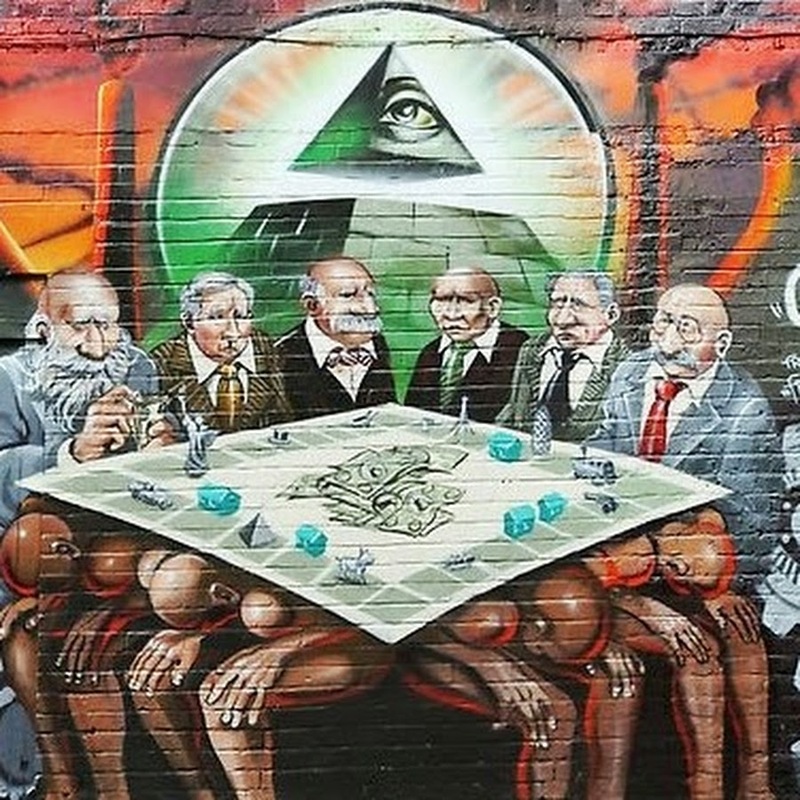 It's certainly got shades of 'new world order' and given the rest of the image suggests there's a pyramid of society in which a small group of rich people at the top play games (gamble? with future wealth and happiness) off the backs of the lower orders, I'd say it's the sort of a thing a Socialist (with Marxist leanings) like Mr C should Like. I think the suggestion they're Jewish comes from nose-shape. Which is a bit racist in itself. I also don't know who the artist was or their intentions/leanings, which would help me read the piece. I also think it (sort of) fits with a narrative - that being Corbyn is an antisemite - that's being pushed by some elements of the media, and so it's used as 'evidence'. Do we know these men don't represent Jews? No. Ergo... It's not something that'd stand up in court, but then trial by media isn't quite as scrutinised as trial by jury.